A delicious powdered lemon and salt seasoning in a shaker that adds an irresistible tang of citrus and dash of salt to snacks and beverages. Salt and lemon powder shaker for your fruits, vegetables and other snacks. Ingredients: Salt, citric acid, sugar, natural dehydrated lemon, calcium stearate, calcium silicate, arabic gum. 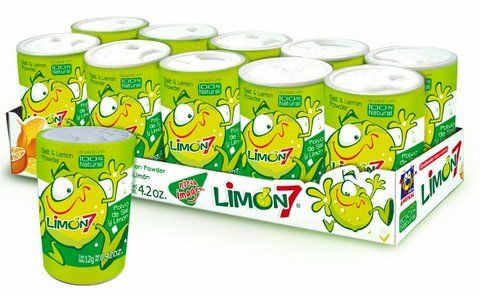 Polvo de Sal y lemon para sasonar frutas, verduras, y otras botanas. Ingredientes: Sal yodatada, �cido c�trico, az�car, lim�n natural deshidratado, estearato de calcio, silicato de calcio, goma �rabiga. Limon 7 is a great product. I recommend it to anyone who wants a great product. The only problem I had was that I ordered 10 units of salt, and only 9 arrived. I called the number on the packing slip, and the gentleman on the phone said he would credit me for the difference. I have not noticed that happen yet. ProsI LOVE this product. I use it on popcorn, carrots....almost anything. Great stuff. ConsThe only problem I had was that I ordered 10 units of salt, and only 9 arrived. I called the number on the packing slip, and the gentleman on the phone said he would credit me for the difference. I have not noticed that happen yet. I never thought to put this on fruit or veggies. Back in my childhood my siblings and myself would just eat it straight. Just lick your finger and dip. Super sour that I remember to this day. ProsI guess good on fruit, never tried it though. ConsEating it straight will burn your tongue so be careful. Have been enjoying this product for ten years now! This is an excellent product. I use it on watermelon, cantalope, apples, carrots and just about anything else in these areas. I ran out and had ben looiing for sometime before I finally found it on the internet at your store. Thanks for again giving me one of life's little pleasures.